We’d love your help. Let us know what’s wrong with this preview of All the Right Stuff by Walter Dean Myers. New York Times bestselling author Walter Dean Myers tackles the social contract from a teen’s perspective in his novel All the Right Stuff. In one of his most thought-provoking novels to date, Myers weaves together political philosophy, basketball, and making soup in Harlem, with the depth that defines his writing career. 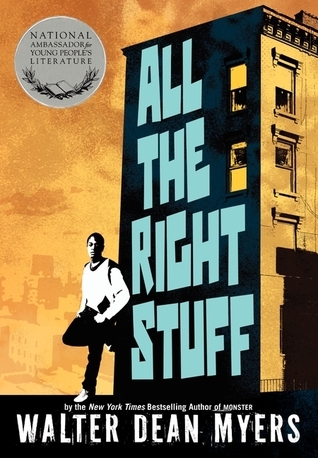 After his father is shot and killed, Paul Dupree fi New York Times bestselling author Walter Dean Myers tackles the social contract from a teen’s perspective in his novel All the Right Stuff. In one of his most thought-provoking novels to date, Myers weaves together political philosophy, basketball, and making soup in Harlem, with the depth that defines his writing career. After his father is shot and killed, Paul Dupree finds a summer job at a Harlem soup kitchen. Elijah, the soup man, questions Paul about tough life choices, even though Paul would rather be playing basketball. Over the summer, Paul begins to understand the importance of taking control of your life. To ask other readers questions about All the Right Stuff, please sign up. Is this a YA or suitable to be shelved in Juvenile Fiction? Michael Perez I would go for YA. This is a "heavy" novel. It makes you think about all the things that are not quite right in America. The story takes place in Harlem, New York. Teen Paul Dupree lands a summer job working at a soup kitchen for the elderly man Elijah. During the summer Paul and Elijah discuss the "social contract" people choose or not choose to live by, thereby enduring the consequences of their actions or the consequences inflicted on them by other people or the government. The story has its roots in the philos This is a "heavy" novel. It makes you think about all the things that are not quite right in America. The story takes place in Harlem, New York. Teen Paul Dupree lands a summer job working at a soup kitchen for the elderly man Elijah. During the summer Paul and Elijah discuss the "social contract" people choose or not choose to live by, thereby enduring the consequences of their actions or the consequences inflicted on them by other people or the government. The story has its roots in the philosophical writings of Thomas Hobbes. The social contract states that people in society will make it as long as they possess the tools that society desires. That hard work is not enough. It is also about that life is going to be harder for some people, and that at times in life it will generally get harder, but you have a responsibility to keep moving forward if you are going to be responsible for "tomorrow". The story also points out the inequities of this thinking. For example, when we charge and prosecute people for a felony and they have paid their debt to society, yet that debt truly never goes away because they have a very difficult time finding a job after it or even possessing the tools that society desires after a stay in prison. Many people, including those in government, will say "so what, they made those choices and now they must face the consequences." It's Walter Dean Myers so you know it's quick, well written, and centers on minority characters. These are all excellent things. And the minority character in All the Right Stuff is a good kid who makes good choices. I love that. So often when minority characters are featured, the opposite is true. Paul DuPree gets lucky this summer because he is one of four teens chosen for a work program. His job is to work alongside Elijah at Elijah's soup kitchen. Elijah is a wise old man who uses his soup ki It's Walter Dean Myers so you know it's quick, well written, and centers on minority characters. These are all excellent things. And the minority character in All the Right Stuff is a good kid who makes good choices. I love that. So often when minority characters are featured, the opposite is true. Paul DuPree gets lucky this summer because he is one of four teens chosen for a work program. His job is to work alongside Elijah at Elijah's soup kitchen. Elijah is a wise old man who uses his soup kitchen not only to feed and improve the quality of life of the elderly in his neighborhood, but also to mentor whichever teen works at his establishment. Elijah's spiel is the social contract. He shows Elijah that although life isn't fair, we get out of life what we put into it. This book was boring af. This is a good book, it really makes you think about what some people go through in their life and how awfull people treat others that dont have much going for them. Most characters in the book have some soft of problem in their life and have a goal to fix it. The book can really touch peoples hearts and get really in your head. This was a really well written book. Being that I have my BA in Sociology, this was right up my alley.I could really relate to the story in it's entirety. Not just with the characters, but with the themes and lessons as well. The book is all about Paul Dupree's struggle with coming to terms with what social contract theory is, and how it impacts him and the people in his life. Paul's transformation is slow and gradual, but the change in him at the end is really noticeable. At first, he really doesn't want to have anything to do with Elijah, or what he has to teach him about social contract theory. He claims that "he really doesn't need to know about all that stuff" and that it hurts his head to think about it. But, little by little, he starts to absorb the information, really thinking about it, turning it over in his head, and applying it to his own life and the lives of those around him. He makes some pretty stark and meaningful realizations, the main one being that no matter the hand you're dealt, you are responsible for your own life, and what you do with it. I think almost anyone can relate to this. We've all gone through tough times in our lives. But, we are the ones that are responsible for what happens, we are responsible for changing our situation. It may not always be easy, but it can be done. This is something that I can relate to personally, as I've gone through some trying times as of late. It hasn't been easy and it hasn't been fun, but I'm trying my best to change things. To learn from these things, grow, and use what I've learned to help me with whatever life throws at me. And that's what Paul does as well. You can see him struggle as he really tries to decide where certain people fit in terms of social contract theory, particularly his father. He doesn't always like the thoughts that he has about him, but you start to see that as a whole, the concept of social contract theory actually gives him something to grab onto, a way to digest and relate his experiences and make it work for his life. There's also a kind of pay it forward element here too, which I really enjoyed. Paul takes what he's learned and passes it on to Keisha, the girl he's mentoring, to try and help her out as well. I think that this book is helpful for young and older adults because the analogies are easy to relate to. I sure could have used this particular story when I was taking Social Theory, it would have helped me have a few less headaches that's for sure. On a less philosophical, more fun note, there are a lot of delicious soups in here that I would love to make sometime. The fact that Paul is learning all these things through his summer job in a soup kitchen is one of the parts of the book I like most, because I really think that you can learn a lot about life, and about yourself when you learn to do something as simple as cooking under the guise of a wise teacher. Paul is very lucky to get one of four public service jobs available through his school in Baltimore. He will be working at a soup kitchen for senior citizens, which is run by the 84-year-old Elijah. Paul is struggling because his mostly absent father, who has had problems with substance abuse, has been shot in a store robbery gone wrong. Luckily, his single mother is hardworking and holds him to very high standards. Elijah teaches Paul not only about soup but about the "social contract" and how Paul is very lucky to get one of four public service jobs available through his school in Baltimore. He will be working at a soup kitchen for senior citizens, which is run by the 84-year-old Elijah. Paul is struggling because his mostly absent father, who has had problems with substance abuse, has been shot in a store robbery gone wrong. Luckily, his single mother is hardworking and holds him to very high standards. Elijah teaches Paul not only about soup but about the "social contract" and how it should motivate everyone, even in their gritty urban neighborhood, to do what is right. As part of his job, Paul is also mentoring a student, who turns out to be 17-year-old Keisha. Keisha has spent years doing the right thing and seeing no result; a brief lapse in her drive led to her becoming pregnant, taking time off school, and putting her chances of getting a basketball scholarship to college at risk. She hopes that Paul will help her perfect her game. A lot of the book is spent discussing the social contract and how it will play out with individuals in the community, especially when Paul's friend Sly has an idea for a business to help people who have made poor choices in the past succeed. Strengths: It is wonderful that the characters in the inner city setting are still depicted as hardworking and desirous of personal success. Paul especially is an engaging character, and Elijah is amusing. After Paul's dad had died recently Paul started working for a kitchen to earn extra money. Elijah the Chef in the kitchen keeps talking to Paul about the social contract. Paul didn't care about anything Elijah said he just wanted to get money so he could provide for his family. But the kitchen was not going to give him all the money he needs. So he starts mentoring this girl called Keisha. Him and Keisha become good friends and help each other in times of needs because both of them live in a dan After Paul's dad had died recently Paul started working for a kitchen to earn extra money. Elijah the Chef in the kitchen keeps talking to Paul about the social contract. Paul didn't care about anything Elijah said he just wanted to get money so he could provide for his family. But the kitchen was not going to give him all the money he needs. So he starts mentoring this girl called Keisha. Him and Keisha become good friends and help each other in times of needs because both of them live in a dangerous part of town. Then when he finds out that Keisha has a baby he is forced not to see her again. After he finds out that her dad and her got in a car accident this killed her dad. Paul then has to either forget about Keisha forever or disobey his strict parents and live with the punishment. All the Right Stuff is about love, choices, and guilt. Not the best Myers book by a long shot. This short book is packed with the philosophical banter between Paul and Elijah, an older man running a soup kitchen he calls Elijah's Soup Emporium. Elijah begins right away laying it on thick with life lessons, using the social contract as a way to get Paul to think. Meanwhile, Paul also must mentor a young black teen with a baby to improve her basketball to hopefully get ahead. There wasn't much to latch on to and I skipped through most of the middle, f Not the best Myers book by a long shot. This short book is packed with the philosophical banter between Paul and Elijah, an older man running a soup kitchen he calls Elijah's Soup Emporium. Elijah begins right away laying it on thick with life lessons, using the social contract as a way to get Paul to think. Meanwhile, Paul also must mentor a young black teen with a baby to improve her basketball to hopefully get ahead. Slow ponderous read with a message that is deeper than the audience might think they would be. this would be an interesting book to read with a 8th or 9th grade class... too didactic I think for simple pleasure reading. Paul DuPree has landed a summer job working at Elijah's Soup Emporium, a soup kitchen for the elderly run by Elijah,who uses the Socratic method to get Paul thinking about social issues and to teach him about the Social Contract. "Hard work by itself isn't worth two cents on a rainy day if it doesn't give you a good life." I don't know if anyone but Walter Dean Myers would be capable of pulling off a book like this one. In the year 2012, when All the Right Stuff debuted in the marketplace, the field of young-adult literature was all about immediacy and action, even in stories without much suspense or adventure. If the events of the narrative weren't designed to generate tensio "Hard work by itself isn't worth two cents on a rainy day if it doesn't give you a good life." I don't know if anyone but Walter Dean Myers would be capable of pulling off a book like this one. In the year 2012, when All the Right Stuff debuted in the marketplace, the field of young-adult literature was all about immediacy and action, even in stories without much suspense or adventure. If the events of the narrative weren't designed to generate tension, then at least the story's relationships had to be intense and emotional, or there had to be a secret waiting to explode, or something volatile had to be on the brink of happening. How could a story succeed that relied almost totally on lively philosophical debate to keep the plot afloat, a story much more about the topics being addressed in conversation by the characters than the characters themselves? In the hands of a lesser author, I'm not sure such a novel could have succeeded, considering the contemporary market for young-adult literature. Walter Dean Myers is so different from any other writer, though, I can see why he would be given license by his publisher to create a book almost purely comprised of debate and philosophical dissertation. All the Right Stuff will never be mistaken for a character-driven thriller, but its pages hum with the power and passion of thoughtful communication and important ideas expressed with vigor and honesty. Whether as part of the mentor/protege relationship between Elijah Jones and Paul DuPree, the challenges to Elijah's political understanding brought up by street-smart Sly, or discourse between others who've had a hard time in life and find themselves leaning either toward Elijah's philosophy or Sly's, the dialogue snaps with speed and wit, and the level of intellectual parrying only increases as the novel goes along. Perhaps a dozen times in the book I found myself struck particularly hard by an idea being expressed, most often by Elijah but sometimes by Paul or even Sly, and couldn't help but be amazed by the magnificent richness of thought continuing to flow from the pen of the great Walter Dean Myers at this late stage in his career. He had proven himself a deservingly legendary author years before the publication of All the Right Stuff, but a book like this can only deepen and strengthen the foundations of that legend. "Life is going to be harder for some people. It's going to be harder at different times in our lives. But if you're not ready to die today, then you're going to be responsible for tomorrow, whether you like it or not." Paul DuPree's father meets his early demise only a few pages into this book. Paul is sixteen, and has lived in the inner city with his mother his whole life. His father was never a big part of the picture, so he isn't terribly broken up about his death, and it soon becomes clear Paul has no intention of following in his father's questionable footsteps. Instead of a summer vacation from school spent chillaxing and forgetting about whatever the future may hold, Paul agrees to volunteer part-time at a local soup kitchen. On the surface the work is fairly basic and doesn't hold much promise of excitement, but Paul is about to find there's quite an education to be earned here, from an elderly retiree named Elijah who helps run the place. Paul is down with engaging in small talk to pass the hours more quickly, but Elijah is much too ambitious a conversationalist to settle for that. Moments after commencing his work at the soup kitchen, Paul becomes deeply involved with Elijah in a conversation about the theoretical social contract that exists in all orderly societies, the unspoken deal of citizen to citizen and citizen to government relations by which we humans balance an existence of freedom and equality with one of safety and security. Why do people work when they could settle for living off welfare payments, and how do we decide the way personal property is divvied up in the private sector? What is taxation all about, and how does our agreeing to pay lawful taxes complete our end of a contract many have little idea even exists? Elijah's practical and well-explained view of the systems of government, capitalism in particular, drive Paul to consider ideas he's never been introduced to in school, ideas that present him with some tough conundrums in the planning and consideration of his own future. Is hard work enough to earn a person a good life, or is more than that required? If one works diligently but has no concept of the social contract as it stands and how to get ahead in the world by using it, is that person doomed to lifelong hard luck and misery, with no way to ever rise into a higher economic class? Has Paul been going about planning for his future the right way, or is he, like so many others, headed for failure? "(L)ife is like walking between two tall buildings on a tightrope. For some, the rope is wide enough and the walk is easy. For others, it's narrow and hard and maybe there's a strong wind blowing through their days". So it goes for most of the rest of the book, Paul struggling to wrap his head around the vital social issues Elijah expounds upon and attempting to complete his own logical trek through the maze of questions that keep popping up in response. A local king of the streets, known as Sly, openly defies Elijah's grand ideas about the social contract and our responsibilities to each other as people living in an organized society. Both in word and deed, Sly repudiates the old man's unshakeable faith in the system, and resorts to underhanded dealings to keep himself in the financial black. Sly is never left wanting for money, but a lot of other people Paul knows are, and Sly's success at beating the system and racking up big bucks in blatant disregard of the social contract seems to fly in the face of all Elijah has been teaching Paul. Is it that easy to get one over on the system, leapfrogging those standing in line for their rightful turn and always hitting paydirt ahead of them? It doesn't seem right to Paul, but there's no arguing with Sly's affluence or influence. Does he know something about the workings of the social contract that Elijah may not have yet figured? When it comes to matters of financial success or failure, getting ahead or facing ruin, I'm convinced most people want more than anything to feel assured they aren't being conned into taking the long way when others are secretly made privy to a shortcut. They don't want to work forty hours a week when others are coasting by putting out little to no labor, whether they're living on welfare or enjoying the high life among the super-rich. It's natural for people to not want to do more than their fair share while others grow fat off their hard work. The social contract under capitalism can be a complicated place, however, allowing for a lot of bizarre fluctuation that often makes little or no sense to hardworking citizens. How does one explain the low wages earned by those in the service industry, or working to plan entertainment for the elderly or for kids in school, while professional athletes and actors are paid gigantic salaries to perform jobs that come with so much more respect and glory? Why are teachers compensated so modestly, when their contributions to the future of any nation are undeniably priceless? These questions do have logical answers, but we're not always going to like them, especially when we're the one being shortchanged by the system. The best and the brightest can so easily fall through the cracks, too, because of the way the job market is constructed. The more an expensive college education is required for jobs of all kinds, the more likely it is that smart, innovative people who can learn and adapt quickly in any setting regardless of their formal education are going to be left out in the cold, passed over in favor of less talented individuals who have the money to put out for advanced college degrees. When higher education is king, those with natural smarts and wisdom frequently end up on the scrap heap, and that's not good for the furtherance or improvement of any country under any economic plan. It's yet another way the social contract appears to be letting us down, but I think we find the answers to this dilemma in Elijah's frank admission that the capitalism contract is fundamentally flawed, and isn't likely to ever become perfect. Nonetheless, it's the best system we have, and we can figure out ways to work within it if we're willing to learn how to do so. Flourishing within the social contract is going to take some luck, for sure, but the lucky breaks are a lot more likely to go our way if we're out there taking chances in the world than if we curl up in a ball and refuse to take part in this unfair social contract society made without our agreement. "What some people wanted was sometimes too hard to get, and the stress of trying was sometimes too hard to deal with... Maybe doing well in life was just too hard for some people." This book is packed with gems of thought I can't get out my mind, which I've found not unusual after reading books by Walter Dean Myers. I think I'll always remember Elijah's statement on page forty-nine about the imbalances of the U.S. Constitution when it was first adopted, seeming to bring about a new republic but not quite as pure as one might have thought. "Women couldn't vote, children couldn't vote, and black people couldn't vote. So what they were really saying was that the white men in this country were going to rule it." While similar statements have been made almost since the beginning of U.S. history, what stands out to me about this particular declaration is that it includes kids. Through the words of wise, well-spoken Elijah, Walter Dean Myers recognizes that without a voice in the government, kids are just as much second-class citizens as any group that wasn't permitted to vote in the past. It's a bold mention most authors wouldn't be willing to make, and I'm so glad this book makes it. Elijah isn't done urging vigilance when dealing with our government, either, continuing his thoughts on page fifty-one: "When we elect a government, we need to watch that government very closely and know exactly how it's supposed to be working. You don't enter a contract with your eyes closed." To watch our government at all times for the slightest hint of turning toward corruption is absolutely essential, because once it becomes corrupt it won't ever turn back toward good on its own. As the saying goes, an ounce of prevention is worth a pound of cure, and nowhere is that more applicable than when dealing with our government. "There was a whole world out there of people thinking about things I hadn't known about just a few weeks before. I wondered what else was out there I should be knowing about." Elijah's friend John Sunday is a perceptive fellow, too, and his conversation with Paul and Elijah is one of the high points of the story. His pithy take on bigotry and prejudice on page ninety-three is certainly worth remembering: "People who want to hate you can find something in you they don't like. They have a talent for doing that." I've observed the uncomfortable truth of that statement time and again in life, as much as I wish it weren't true. Sly, neighborhood racketeer and and not-so-underground gangster who defies the idea of the social contract laid out by Elijah having any meaning in his life, on page one hundred twenty-two adds his own slice of deft wisdom to the growing treasure trove found in this book: "When most people run into a problem, the first thing they do is stuff cotton in their ears and close their eyes. Most of your life, that's what you're going to want to do, and most of the time, it's going to be what you do." Sly is much more than a lowlife thug. As the reader will learn, he has had his own conversations with Elijah on the subject of the social contract, and is significantly more educated on the matter than one might presume. One might even consider calling Sly a sophisticate, as his well-articulated opinion on the subject of people tending to ignore problems they don't want to face would indicate. "But in the end, we learn we can forgive most people. The cushion of mortality makes their wrongdoing seem less dark, and whatever roads they traveled seem less foolhardy." All the Right Stuff could spark hours and hours of heated social, political and economic debate, and is sure to provoke at least that much thought in those who give it a careful read. More than anything, most of us want to lead a happy life, and being pressed into meaningless labor for the majority of our days is a claustrophobic proposition. To work forty hours per week doing something that means nothing to us isn't much better than serving a part-time prison sentence. While this book offers no quick fixes to the problems of everyday life under the yoke of the capitalist social contract, Walter Dean Myers's keen insight on such matters should not be missed by anyone, and All the Right Stuff is the perfect venue by which to receive it. There may or may not be another author who could get away with writing a young-adult book like this one, a novel in which the characters verge upon being props for the debates they vocalize, but Walter Dean Myers has done it beautifully, with style and eloquence and a firmly rooted sense of right and wrong and where they intersect in the world of American idealism. Walter Dean Myers is a thinking reader's author and All the Right Stuff is a thinking reader's novel, so it shouldn't come as a surprise that I would recommend this for book for thinking readers. In fact, I would recommend it for all thinking readers everywhere, and that isn't a statement I often make. Kudos to Walter Dean Myers on the creation of yet another uniquely effective literary experience. Have you ever read a book, got to the end and realized that you didn’t remember anything about the story because it was so boring? In All The Right Stuff, Paul shares his experience working a summer job at a soup kitchen where he meets someone that changes his outlook on life. Everyone should not read All The Right Stuff because it lacks plot and the characters aren't interesting. In All The Right Stuff, Paul begins a summer job at a Soup Kitchen and he meets an older man named Elijah that teaches him about the “Social Contract” and that he is responsible for his “tomorrow.” The majority of the story is basically Elijah explaining the “Social Contract.” There is no climax, conflict, rising action, nor falling action. This book is very preachy, textbook-like and quite boring. In her Goodreads review, Alicia also argues that “There wasn’t much to latch on to and I skipped through most of the middle, finding that I wasn’t missing much.” meaning that the story was repetitive and it didn't have any new plot developments, which allowed her to skip the middle of the book. As this review argues, this book has no substance. In addition, when I was reading All The Right Stuff it was repetitive and boring, which makes the story hard to understand. The lack of plot development contributes to the characters being very static and not developing over the course of the story. The characters are very Two-Dimensional. They essentially say what you anticipated them to say. For example, one of the few characters Elijah, is the same monotonous old man that is trying to embed this information about the “Social Contract” into Paul’s mind. The lack of interest in characters makes this a challenging book to read. In conclusion, I do not believe that anyone should read All The Right Stuff. It is a very disoriented book because it lacks plot development. Furthermore, the characters aren’t intriguing. If you come across this book don’t think twice about buying it. In All the Right Stuff by Walter Dean Myers, the main character, Paul Dupree, describes his summer life. During a reading project last year numerous friends of mine recommended that I should read this book for the project but instead I read another book. Since I got the opportunity again, I read it this time. It was a short but humble and fun book to read. The book describes life in poverty from Paul’s point of view. Paul is a sixteen-year-old boy in high school who is about to have a interesting summer. His father is shot to death at the age of forty-two. So he takes up a job to make money and he makes ten dollars an hour during the summer break. After Paul accepts a community job working at “Elijah Jones’s Soup Emporium” he learns about what a social contract is and each day he learns a little bit more about the social contract. But Elijah’s version of the social contract is only the beginning. Paul get others opinions on the social contract. Sly the notorious Harlem big shot and mysterious rich man who has a dedicated bodyguard named D-boy who would shoot someone if Sly told him to. He knows about the social contract but thinks about it in a different perspective than Elijah. Sly thinks that the social contract is meant to keep the poor down. Elijah an eighty-four year old man who is obsessed with the social contract. He contributes to the social contract by providing the senior citizens a great bowl of soup. Elijah passes his theories and ideas onto Paul in hopes of carrying on his ideas about the social contract. Everyone has their own opinions of the social contract and each one of their opinions changes Paul’s outlook on life. Paul gets a job in a soup kitchen the same summer his father dies in a store robbery gone wrong. Elijah, the owner of the Soup Emporium, begins a conversation about the social contract and the different roles people play in their communities. Paul begins getting different people's opinions on the social contract, from Keisha, the teen mother who is looking to use her basketball skills to get out of Harlem, to Sly, the notorious Harlem big shot. Everyone Paul meets has their own opinions of the s Paul gets a job in a soup kitchen the same summer his father dies in a store robbery gone wrong. Elijah, the owner of the Soup Emporium, begins a conversation about the social contract and the different roles people play in their communities. Paul begins getting different people's opinions on the social contract, from Keisha, the teen mother who is looking to use her basketball skills to get out of Harlem, to Sly, the notorious Harlem big shot. Everyone Paul meets has their own opinions of the social contract and how people should relate to one another. What exactly is the social contract and why should Paul even care? I taught this book, and I suspect that it WDM wrote it with the intention of it being taught to late middle/early high school students. It is as easy a read as it can be with Hobbes, Locke, Rousseau, and Rawls being bandied about by the main characters. If I teach this book again, I will teach it as an introduction to our civics unit for ELA I. I don't think it worked as a hook book for getting my students into reading. A few have really cleaved to the ideas put forward and the way that they are I taught this book, and I suspect that it WDM wrote it with the intention of it being taught to late middle/early high school students. It is as easy a read as it can be with Hobbes, Locke, Rousseau, and Rawls being bandied about by the main characters. If I teach this book again, I will teach it as an introduction to our civics unit for ELA I. I don't think it worked as a hook book for getting my students into reading. A few have really cleaved to the ideas put forward and the way that they are being put forward, but I think overall this lacks the teeth that it needs to really engage kids. This book is a book about a change in life and having to deal with consequences. This book shows what it is like to deal with things that you want to do, and things that you need to do. It gives away an adventure of how a character can change their way of living and way of thinking by just a couple outcomes. If you want to read a book about inspiration and changing or controlling bad situations, this is the book. I like the way the character develops, but it was a slow read for me because I was trying to understand the Social Contract. I think many students would put it down because it seems too textbook-like wit all its description of the social contract every other page. I read this book for my job; it's not one I would pick up on my own. Still, it's an easy, relatively enjoyable read. The writing style is simple and there's not much nuance but it does make for a book that's easy to discuss with teenagers. Everyone should read this book! The way that the "social contract" is explained and develops over the course of the novel is a brilliant way to spark discussions with youth. This would be a great novel study for not only literature courses, but history courses as well. This was a good book but it was a little repetitive for me, but was surprisingly fast paced. I was forced to read this book twice- nothing really substantial about this book even though it tries to sprinkle in profound life lessons through colloquial dialogue between characters. In the novel “All the Right Stuff” by Walter Dean Myers, a young man Paul DuPree was born and raised in the streets of Harlem. He lives an extremely tough life because his mom and dad separated when he was at a young age and he just got news that his father was shot during a robbery. After this Paul gets a job at Elijah’s soup emporium. Elijah teaches Paul throughout the story about this social contract that everybody should live by, but it’s not a written set of rules so it’s not mandatory for everyone to follow. Throughout the novel as Paul comes to the soup emporium every day to make soup for the elderly people of Harlem Elijah teaches Paul more and more about his social contract and Paul eventually starts to understand what Elijah is talking about. Paul is asked to mentor a WNBA prospect named Keisha in basketball to help her with her outside shot so she could go professional. Keisha has also lived a troubled life and ended up having a baby at the age of fifteen with a man eight years older than her. Paul not only helps her with her outside shot, but helps her with life. He uses his knowledge of the social contract that Elijah taught him and starts to pass it on to other people he meets. For example, Paul talking to Keisha about the social contract says, “The social contract is an agreement between people and between the people and their government for everybody’s mutual benefit.”(Myers 197). Paul is using his knowledge of the social contract and is spreading it to the people around him who need its help. The theme of this novel is that the social contract is not always fair; it’s how you handle adversities in life that will push you through happily. For instance, when Elijah and Paul are talking about the social contract Paul says, “The social contract is not big on being fair. I think that every time you see that something is unfair, you feel bad and you want to give up.”(Myers 203). A humans natural instinct when life gets tough is to give up, but this shows that if you stick to the social contract and handle adversity well you can be happy and successful. During this novel the author uses a lot of conflict and imagery to impact the readers’ emotions. For example, Paul’s conflict is that he never knew his father because his parents got separated while he was young. To make this even worse he finds out that his dad got shot outside of a convenient store on accident by a robber. Also, Keisha faces great conflict in her life throughout the novel. We learn that her household while she was young was an awful living condition because her parents were always fighting. Then, she had a baby at the age of fifteen which caused her to drop out of school to take care of the baby. Finally, Keisha has to face the WNBA scouts doubt in her that she wouldn’t be successful in the league because she doesn’t have an outside shot. The conflicts that Myers uses throughout the novel make us feel for certain characters and get attached to them. Also, Myers uses imagery to help explain his thoughts to readers. For example, while Paul is talking to Keisha about the social contract he refers it to a race when he says, “Okay, I got another way of looking at it,…somebody told you that if you went along that track, you’d get a free dinner for the rest of the week for you and your daughter okay?...but then when you got their they handed you seven peanut butter and jelly sandwiches. How would you feel?... Especially when you saw that the people who got their first got coupons to have dinner at fancy restaurants.”(Myer 197). This helps us understand that the social contract isn’t fair but it still works if you use it right. I thought that this book was amazing. It taught you life lessons about everything that you can use in modern day life. I would recommend this book to anybody, even people who aren’t big on reading because I don’t usually read at all but I loved this book. I think a reader who likes to learn about life would appreciate this book the most. Paul DuPree has landed a summer job working at a soup kitchen in Harlem. Owned and operated by Elijah Jones, a philosophical elderly man who wants to give back to others. Paul and his mother live alone, and Paul continues to try to make sense of his father's life and death. While teaching Paul how to prepare different soups, Elijah introduces him to the concept of the social contract by which he lives his life. As Paul ponders these new ideas. He encounters others, including a Harlem entrepreneu Paul DuPree has landed a summer job working at a soup kitchen in Harlem. Owned and operated by Elijah Jones, a philosophical elderly man who wants to give back to others. Paul and his mother live alone, and Paul continues to try to make sense of his father's life and death. While teaching Paul how to prepare different soups, Elijah introduces him to the concept of the social contract by which he lives his life. As Paul ponders these new ideas. He encounters others, including a Harlem entrepreneur and an unwed teen mother named Keisha who also has excellent basketball schools, whose fates may hinge on what they know about this social contract. I really liked the philosophical arguments between Sly and Elijah and how Paul begins to understand how the world really works as the conversations deepen. Paul DuPree gets lucky this summer because he is one of four teens chosen for a work program. His job is to work alongside Elijah at Elijah's soup kitchen. Elijah is a wise old man who uses his soup kitchen not only to feed. But,to improve the quality of life of the elderly in his neighborhood, but also to mentor whichever teen works at his establishment. Elijah's spiel is the social contract. He shows Elijah that although life isn't fair, we get out of life what we put into it. Elijah says,"Hard work by itself isn't worth two cents on a rainy day if it doesn't give you a good life"(Myers 103). Keisha has spent years doing the right thing and seeing no result; a brief lapse in her drive led to her becoming pregnant, taking time off school, and putting her chances of getting a basketball scholarship to college at risk. She hopes that Paul will help her perfect her game. A lot of the book is spent discussing the social contract and how it will play out with individuals in the community. Especially when Paul's friend Sly has an idea for a business to help people who have made poor choices in the past succeed. Elijah at the soup kitchen talks nonstop about the social contract and how everyone is a part of it even if they don’t know. This gets Paul thinking and while they work together in the kitchen. Paul starts addressing his life and the people in it, all centering around the social contract. Elijah does not tell Paul the definition of what a social contract is. He wants Paul to figure it out for himself. Paul’s Friday job comes into play as he tries to get Keisha to tell him what the contract is. She hasn’t the foggiest idea and when he finally figures it out, Paul tries to help Keisha put the contract to her advantage. The people Paul meets over the summer are real and surprising well-rounded. Paul says, "I've got more room inside my head for other people, and more understanding of what they are about even though I don't have all the answers"(Myers 175). No one is the cookie cutter image you think they will be at first, not even Sly. The supposed bad guy who actually works hard to help people. I thought this book was very serious because it was talking about possible life situations. The book holds a lot of talk and discussion, but somehow the dialog and characterization keeps you turning pages. And it makes you think about the thing called a Social Contract,something individuals may chose to complain about or ignore, but that never ignores us. Walter Dean Myers was born on August 12, 1937 in Martinsburg, West Virginia but moved to Harlem with his foster parents at age three. He was brought up and went to public school there. He attended Stuyvesant High School until the age of seventeen when he joined the army. After serving four years in the army, he worked at various jobs and earned a BA from Empire State College. He wrote full time after 1977. Walter wrote from childhood, first finding success in 1969 when he won the Council on Interracial Books for Children contest, which resulted in the publication of his first book for children, Where Does the Day Go?, by Parent's Magazine Press. He published over seventy books for children and young adults. He received many awards for his work in this field including the Coretta Scott King Award, five times. Two of his books were awarded Newbery Honors. He was awarded the Margaret A. Edwards Award and the Virginia Hamilton Award. For one of his books, Monster, he received the first Michael Printz Award for Young Adult literature awarded by the American Library Association. Monster and Autobiography of My Dead Brother were selected as National Book Award Finalists. In addition to the publication of his books, Walter contributed to educational and literary publications. He visited schools to speak to children, teachers, librarians, and parents. For three years he led a writing workshop for children in a school in Jersey City, New Jersey.